The above info came from Tru Gundam Phan, and was edited by yours truly (contact me). A boy named Zero Enna (called Rei by his mother) joins this army-type thing that uses these special weapons called Ingrids (also known as Goddesses), which are basically just powerful battle mechs. Zero wants to pilot one of these. When Zero was a boy, these enemies called Victims attacked his colony. His life was saved by the white goddess, who saved him from being swept out into space. Zero is determined to become a pilot for the G.O.A. (Goddess Operation Academy), an outpost to protect the home planet Zion. Zero is not alone in his training, as he has many friends and rivals to meet or beat in these tests. His dream is to become a pilot and ride the white Ingrid, or goddess, the one star pilot Teela Zain Elmes rides. When the candidates have an EX reaction, their hair turns blueish. 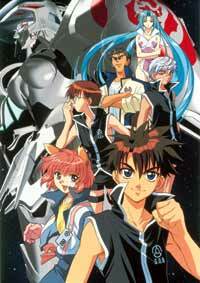 The series is left off at a cliffhanger, but the opening animation suggests that Zero becomes a pilot in the future. The above description came from Tru Gundam Phan, and was edited by yours truly (contact me).